Nexus 9 is the latest Android tablet, made in collaboration with Google and HTC, running the latest Android 5.0 Lollipop OS. The tablet comes with some pretty good specifications – a Dual-core 2.3 GHz Denver CPU under the hood along with 2 GB RAM. It has a Kepler DX1 GPU. But still, to get the most out of your tablet, rooting, unlocking Bootloader and installing recovery are a must. Soon there will be lots of custom ROM and tweaked kernel available for Nexus 9 as the tablet is selling like hot cake and developers too are attracted toward it. Xda dev forum has already reported some development going for Nexus 9. Nexus 9, like all other tablets out there, ships with its Bootloader locked. But if you want to install custom ROMs you need to unlock it. So here goes the tutorial of unlocking its Bootloader. Go to settings -> About Device, and tap the Build Number repeatedly a few times till you enable developer options. Also, you need to have the Android SDK already installed on your computer, and you need to have a data cable as well for connecting your Nexus to the PC. So, now that everything is ready let the fun begin! When you connect your tablet to the PC, you should tick the USB debugging option. Your tablet should restart, and it should enter the Bootloader menu. You will get a confirmation page with warnings like your warranty will be void, all your apps will be wiped out etc. (You already knew those, right?). Confirm it with the power button. So now, disconnect your tablet, reboot it, and finally you have successfully unlocked the Nexus 9 Bootloader! So before starting the tutorial, you need to download the recovery image file from this website- Nexus 9 recovery image. Remember that this is only for Nexus 9, and must never be used on any other Android device or else your device might be bricked. Switch off your Nexus 9 and press the volume down and power button simultaneously which will boot the device into the Bootloader menu, or you can follow step 3 in the above tutorial. Both will function perfectly. And you are done! You have successfully installed TWRP recovery on your Nexus 9. Rooting this tablet is actually extremely easy, and the entire credit goes to developer Chainfire, who has created an awesome tool called CF Auto Root. 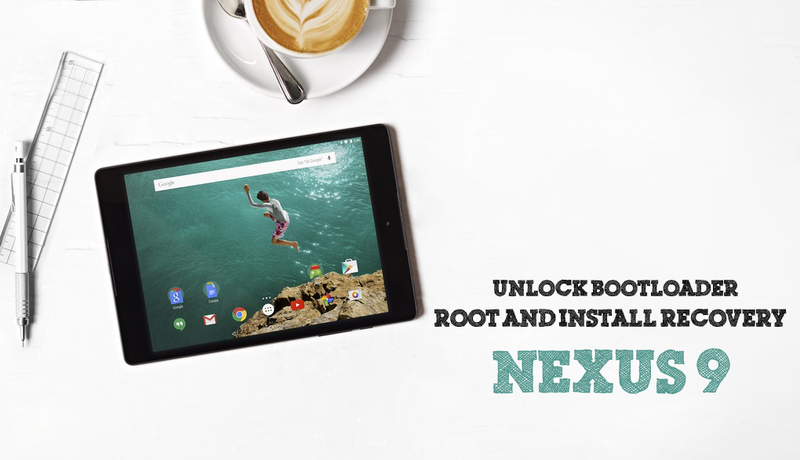 This tool can easily root your Nexus 9 with just one click! You can download the tool here. So before starting, you need a few tools ready which you will need during the process. After it is done, the tablet will reboot and your Nexus 9 will be rooted! You should find the SuperSU app in your app drawer. If you have followed all the steps perfectly, by now your Nexus 9 should be rooted with TWRP recovery installed. These might seem a bit difficult for first timers, but with practice you will realize how easy this is. Happy rooting!